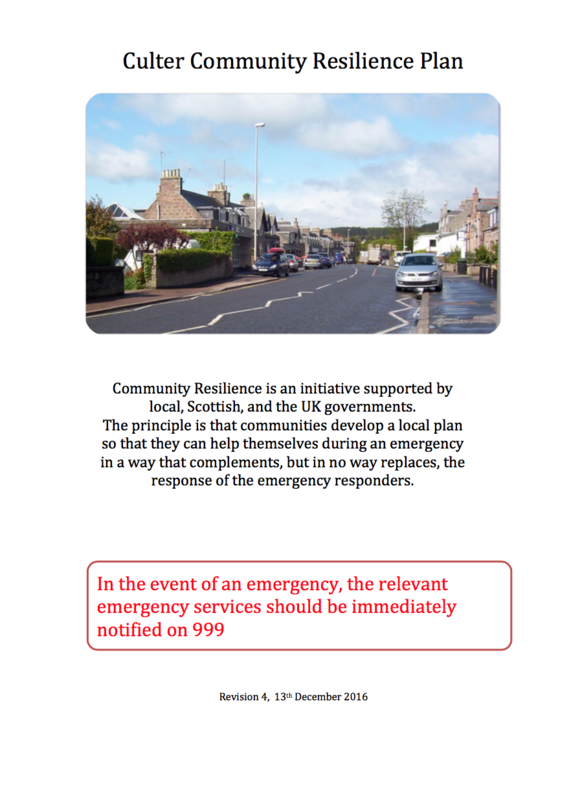 Culter has Community Resilience Plan which is available to download here. Paper copies can also be obtained from Culter Library. The plan has information on what to do in emergencies such as severe weather, flooding, and so on. Please download it and read it. Any comments or suggestions would be welcome. 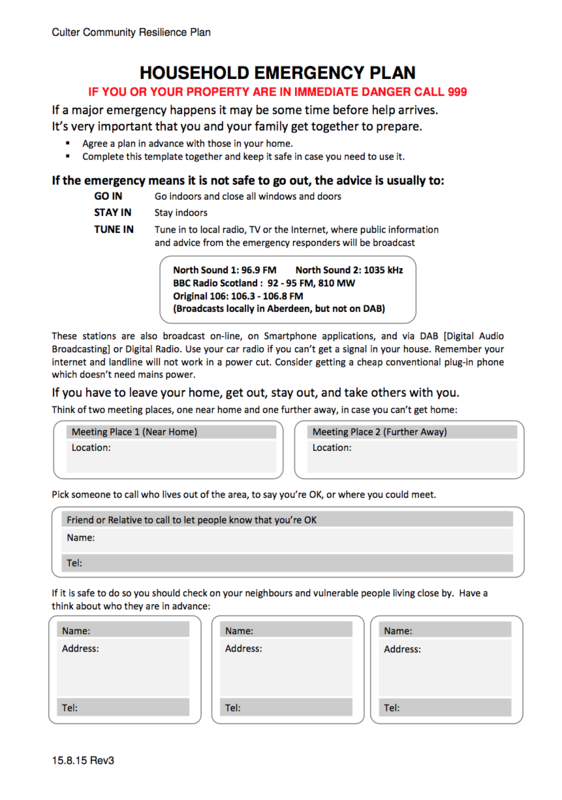 There is also a Household Emergency Plan for you to download for your own use. A key part of our community resilience is the network of volunteers. These are local residents who provide their time, skills, hospitality etc. as and when the need arises. Volunteers can help with a range of tasks such as transport, moving sandbags, delivery of emergency supplies, checking on vulnerable residents, clearing snow, providing accommodation, assisting at the reception centres. Many people do this on an informal basis, helping neighbours and those they know but we need a roster of people who would be available to be mobilised on a more formalised, structured basis. Would you be willing to help out in this way? Do you have any relevant skills or equipment that you think might be of help in an emergency? If so, we would like to hear from you. You can read more about the role of volunteers in the resilience plan itself. If you would like to volunteer, please complete the online form by clicking here. If you prefer, you can download a paper form here or pick one up at the library. Please return paper forms to the library. All information provided will be treated confidentially and in line with the Data Protection Act. Some properties in Culter have, in recent years, been at risk from flooding. The following information may prove useful to those who may be affected. The UK government has introduced something called ‘Floodre’ which helps to provide recommendations for obtaining a competitive insurance quote and also recommends some insurers to approach:- click here. Aberdeen City Council provides some funding for flood protection for your property. For information on how to apply, click here.